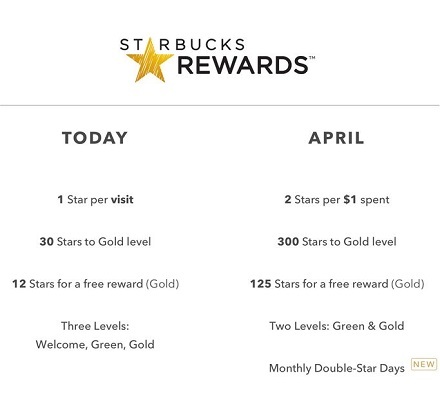 Starbucks has announced a major overhaul to its rewards program that will take place in April. The current rewards program gives members 1 star per purchase made – regardless of what they are purchasing. That means that customers get one star for an inexpensive cup of tall, drip coffee and one star for two $5+ soy caramel macchiatos, if they are ordered during the same transaction. A total of 12 stars yielded one free item. The new system will reward customers with two stars per dollar spent and the freebie will be added to the account when you rack up 125 stars – or a minimum of $62.50 in purchases. While some are disappointed about the change – mostly those who only bought single, tall drip coffees – most customers will be happy with it. It means that you’ll get more heavily rewarded for purchases of pricier drinks, food items and coffee – and if your average transaction is about $6, you’ll be rewarded after fewer than the 12 purchases required by the old system. You can still pay for your friends’ drinks to get extra points, but the guy in line in front of you will never again tell the barista to ring up every single item in a separate transaction to get those points. There will be double point days and other ways to earn points, as is the case now, as well.